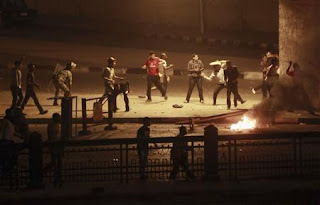 (Reuters) - Christians clashed with military police, leaving at least 24 people dead in Cairo, and the cabinet called an emergency meeting for Monday, vowing the violence would not derail Egypt's first election since Hosni Mubarak was toppled. "This is a dark day in the military's history. This is betrayal, a conspiracy, murder," Magdy el-Serafy wrote on Twitter where he and other Egyptians voiced frustration at the army's handling of the protest. 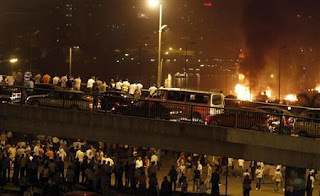 "What happened in front of the state TV building is exactly what happened on January 25," wrote Muslim activist Asmaa Mahfouz, referring to the start of the anti-Mubarak uprising. Christians, who make up 10 percent of Egypt's roughly 80 million people, took to the streets after blaming Muslim radicals for partially demolishing a church in Aswan province last week. They also demanded the sacking of the province's governor for failing to protect the building. 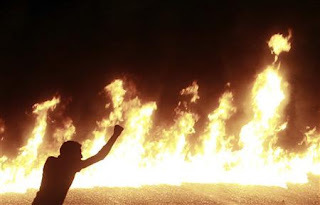 Tensions between Christians and Muslims have increased since the uprising. But Muslim and Christian activists said the violence Sunday was not due to sectarian differences but was directed at the army's handling of the protest. "Instead of advancing to build a modern state of democratic principles, we are back searching for security and stability, worrying that there are hidden hands, both domestic and foreign, seeking to obstruct the will of Egyptians in establishing a democracy," Sharaf said on state television. "We will not surrender to these malicious conspiracies and we will not accept reverting back," he said in his address. The cabinet said in a statement that it would "not let any group manipulate the issue of national unity in Egypt or delay the process of democratic transformation" which it said would begin with opening the doors to candidate nominations. "The most important thing is to contain the situation, see the way forward and the necessary measures to avoid any ramifications," Hegazy said, adding a committee of prominent figures from the church and Al-Azhar mosque would also meet. 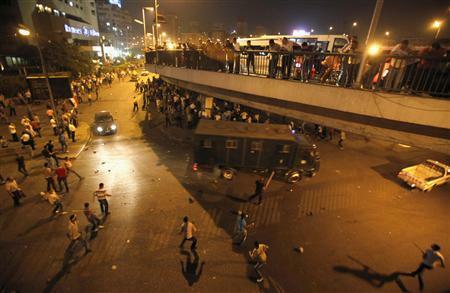 The army imposed a curfew on Cairo's Tahrir Square, the focus for protests that brought down Mubarak, and the downtown area. It was set from 2 a.m. to 7 a.m., (0000-0500 GMT). Pictures of smashed faces and dead bodies of what activists said were bodies run over by military vehicles circulated online, with angry comments comparing the violence used by the military to that of Mubarak's hated police in the uprising. "What happened today is unprecedented in Egypt. 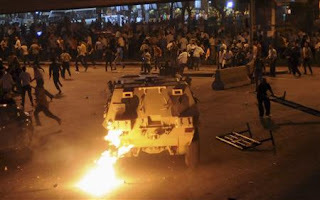 17 corpses crushed by military tanks," Hossam Bahgat, human rights activist tweeted from hospital. "I saw bodies missing hands and legs, heads twisted away or plastered to the ground." Protesters also took to the streets in Alexandria, Egypt's second city. The government appealed for calm. In comments published on his Facebook page, Sharaf said he had contacted security and church authorities about the situation, saying the one ones to benefit were the "enemies of the January revolution."